« Is it ethical to buy an iPhone or iPad made in a Chinese sweatshop? Now that’s changing. CNN’s Ivan Watson is reporting that militants in northern Syria hold substantial territory near the Turkish border, and fear an onslaught against them if the government troops capture the city of Homs and move north. It’s a crisis and an opportunity. If the outside world wants to help there’s a place and a force they can help. We may be days away from a consensus among neighbor Turkey, the Arab League, and NATO not to stand by and watch thousands more killed by their own government. Calls for the administration to act are likely to increase in coming days. Politics and ethics may create irresistible pressure to intervene militarily. 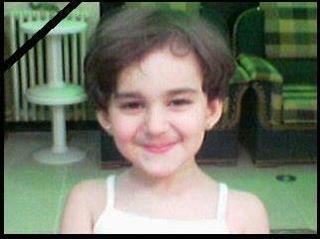 *The photo is of one of the dead, seven-year old Assil Anwar Jabr, daughter of two doctors in Daraa province, shot and killed last Saturday at a checkpoint in Dael when Assad’s forces opened fire at her mother’s car after they gave them permission to pass. This entry was posted on February 17, 2012 at 11:25 pm and is filed under Ethics-general, International, military, Turkey. You can follow any responses to this entry through the RSS 2.0 feed. You can leave a response, or trackback from your own site. The look oh this young Syrian girl’s face suggests that she is such a casualty. the people of the world!!!!!! Beat me to this topic by juuuuuust this much, Bob; my depressing answer to your timely question was just posted.at Ethics Alarms.